Despite recent research identifying a clear anthropogenic impact on glacier recession, the effect of recent climate change on glacier-related hazards is at present unclear. Here we present the first global spatio-temporal assessment of glacial lake outburst floods (GLOFs) focusing explicitly on lake drainage following moraine dam failure. These floods occur as mountain glaciers recede and downwaste. GLOFs can have an enormous impact on downstream communities and infrastructure. 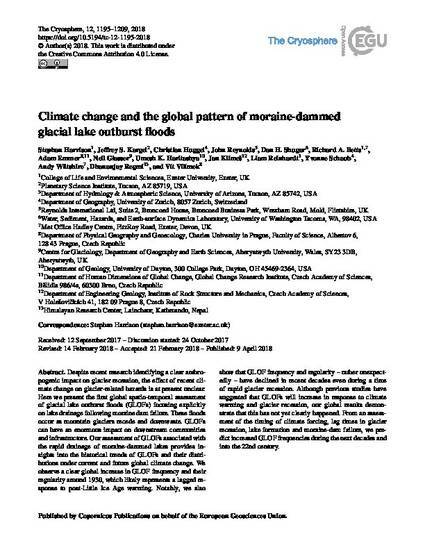 Our assessment of GLOFs associated with the rapid drainage of moraine-dammed lakes provides insights into the historical trends of GLOFs and their distributions under current and future global climate change. We observe a clear global increase in GLOF frequency and their regularity around 1930, which likely represents a lagged response to post-Little Ice Age warming. Notably, we also show that GLOF frequency and regularity – rather unexpectedly – have declined in recent decades even during a time of rapid glacier recession. Although previous studies have suggested that GLOFs will increase in response to climate warming and glacier recession, our global results demonstrate that this has not yet clearly happened. From an assessment of the timing of climate forcing, lag times in glacier recession, lake formation and moraine-dam failure, we predict increased GLOF frequencies during the next decades and into the 22nd century. Supplemental data is attached to the PDF. Stephan Harrison was funded by a Leverhulme Research Fellowship. Stephan Harrison, Richard A. Betts and Andy Wiltshire acknowledge funding under the HELIX (European Union Seventh Framework Programme FP7/2007-2013 under grant agreement no. 603864). Andy Wiltshire and Richard A. Betts acknowledge funding from the Joint UK DECC/Defra Met Office Hadley Centre Climate Programme (GA01101). John Kennedy of the Met Office Hadley Centre provided advice on handling the temperature observation data sets used in this project. Contributions by Jeffrey S. Kargel, Umesh K. Haritashya, Dan H. Shugar, and Dhananjay Regmi were supported by NASA’s Understanding Changes in High Mountain Asia programme, the NASA/USAID SERVIR Applied Science Team programme, and by the United Nations Development Program. We thank C. Scott Watson and an anonymous reviewer for their detailed and incisive reviews of the paper. We also thank Georg Veh, Jonathan Carrivik and Sergey Chernomorets for further comments and clarifications of the inventory. Copyright © 2018 by the Author(s). This work is distributed under the Creative Commons Attribution 4.0 License.